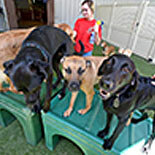 Drew Detlefs, owner of Camp Bow Wow Baton Rouge, discusses value of socialization for dogs at Camp. Drew Detlefs' eyes almost never leave the screen of the television in his office at Camp Bow Wow, a day care center for dogs. He has cameras monitoring nearly all areas of the 14,000-square-foot facility on Pecue Lane. It is, so far, the largest Camp Bow Wow location in the country, he said, and he built it big for a reason. There's a market for it. It was a slow day on a Tuesday in March when Detlefs pulled up his day camp count. "We have 113 dogs here today. And that will pick up later in the week," he said, eyes continually darting back to the cameras, which are available all day as a live stream for "pet parents," as he calls his clients. In his busier times — and Easter/spring break is one of those — Camp Bow Wow has had as many as 189 dogs. "We've heard that some employers have started blocking our site at the office, because I guess people were spending too much time watching the live streams," Detlefs said. "I had a couple of husbands call and beg me not to let their wives buy a cabin, because they'd be watching the dog sleep during vacation," he laughed. Regular pens are available for overnight stays, but clients can upgrade to a cabin, which has an in-room camera that live streams to the website, and a television, tuned to either the Cartoon Network or Animal Planet. And for all those groaning at the thought of paying for doggy day camp, there are many happy clients whose dogs no longer destroy the furniture while they're alone in the house, Detlefs said. "It's socialization and stimulation," he said. "Our counselors aren't there to play with the dogs. "The dogs aren't here for human interaction. They get some, but it's very limited. That's not the point. The point is interaction with other dogs. They come here to be a dog," he said. And when they get home, they're better able to relax and be a companion animal. After an extensive interview process to spot any problems with aggression or anxiety, dogs are divided up by size and temperament. "Sometimes the dogs in the midsize pen will start getting their energy up too much," Detlefs said. "We can bring a really calm larger dog with good energy in to bring that pen back a little," he said, pointing out a large Doberman in the medium dog pen. Counselors' main job is to keep the energy below the level that causes problems. Playing is good. Aggression isn't, and there is a zero-tolerance policy for dogs that cause fights. Counselors walk the perimeter of the pens with a spray bottle to calm any aggression issues that might arise. There is also a hose in each pen for real emergencies, Detlefs said, but he can only count two times they've had to go that far. "And even then, by the time we got the hose ready, just a few seconds, the scuffle had resolved itself," he said. One of the services Camp Bow Wow provides is training for any issues the dog may have developed at home, said Patrick Ransom, on-site trainer at the camp. "It's a great setup for training dogs, especially if they're here all day. We can bring a dog in for multiple lessons on the same day, and give them play breaks in between," Ransom said. That allows him to work with the dogs when they are at their most focused, and generally, that means less training is required. Often, Ransom said, just coming to Camp Bow Wow a couple times a week for a few hours resolves any behavioral problems at home. In addition, for all those dogs who don't make the camp cut — only spayed or neutered dogs are allowed, and they must have a base level of socialization — there's also a home-visit service called Home Buddies. "We have something for every situation," Detlefs said. For Teresa King, an ear, nose and throat doctor with two golden retriever/poodle mixes, Camp Bow Wow was a game-changer, in more ways than one. "I know, I used to be one of those people who thought, 'Wait. Day care? For your dog? Are you serious? No way would I ever do that,' " said King, who has been a client since Detlefs opened his facility a little more than a year ago. When Lucy and Coco reached about 7 months, "I couldn't keep up with their energy needs," she laughed. Now she brings the dogs twice a week, which is all they need to be calm at home. In fact, they're so calm, she got them certified to be therapy dogs. "I take them twice a month to Pennington, to people being treated for cancer," she said. "I've been a doctor for 71/2 years, and honestly, after a while, I was starting to get a little burned out," she said. If bringing her dogs to camp twice a week made them better dogs, she said, bringing her dogs to Pennington twice a month has made her a better doctor. "It really speaks to what I got into medicine to do. I wanted to help people, and I have honestly been happier all around since I started this," she said. They're all in it, at heart, for the dogs, Detlefs said. "We've got a fantastic team here, and I'm looking into opening a couple more locations in the Mid City and downtown area. A lot of our clients travel a long way to use Camp Bow Wow," he said.